We’ve revisited the Totoro theme with this cake, only this time our furry friend is fast asleep on a charming tree stump cake. His two little totoro pals are also back for the ensemble. My Neighbor Totoro by Studio Gibli continues to be a popular theme and request for cakes as it quickly becomes a classic for both kids and adults alike. 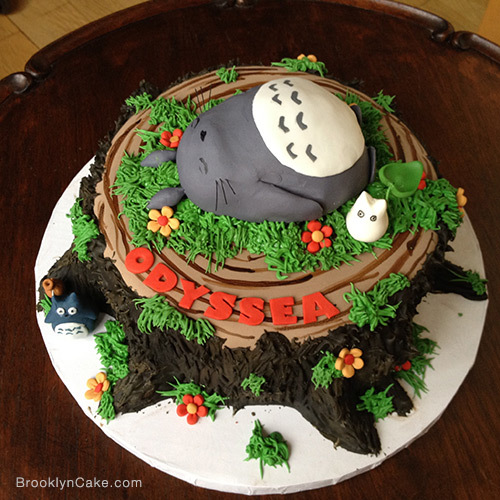 In fact, the majority of Totoro-themed cakes seem to be for adult birthdays. Some other unique renderings would be to create a full sculpted tree cake, with the characters from the movie atop, either shaped from fondant, gum paste or modeling chocolate. A lower cost option would be to ensemble a more tradition style tier with 2D depictions of the movie around it. If sculpted character cakes interest you, you also take a look at the Sculpted Dog cake, the Sorting Hat Harry Potter cake, and of course, the original Totoro Cake. Other personlized custom birthday cakes to peruse are the iPhone cake, the Air Jordan Cake and the Tomato Birthday Cake.